I came across this very interesting and well written article on Mail Online on 21 May 2011. (http://www.dailymail.co.uk/news/article-1388830/Familys-antique-Chinese-teapot-sells-2m--1-7m-MORE-valued.html). "A tiny teapot has caused a storm after it sold at auction for two million pounds - 1.7 million over its estimate. The item was made out of precious white jade and was crafted for the famous Chinese emperor Qianlong during the 18th century. Despite being 275-years-old, the teapot's condition remained exquisite, having hardly ever been used for tea-making. It was taken out of China by the British in the 19th century and was put on display at the International Exhibitions in London in 1871 and 1886. It was then bought by the British aristocrat Hinton Daniell Stewart in the late 1880s and has been passed down through his family. A relative, who lives in the south-east of England, was the beneficiary of the staggering sum paid by a Hong Kong buyer. The oriental market is buoyant at the moment as newly-rich Chinese collectors seek to buy back their heritage. 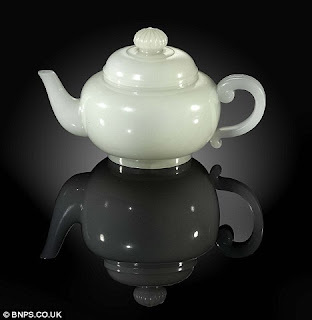 Clare Durham, of auctioneers Woolley and Wallis in Salisbury, Wiltshire, said: 'It might look like a normal teapot to the untrained eye but this item has been made from one of the finest pieces of stone you are ever likely to find. 'It is probable that this piece was made towards the end of the Qianlong reign, when large jade boulders were often carved to make pieces of art. 'You cannot fault its condition. It is a piece of stone that is pretty much flawless. There are no chinks or chips in it. 'It is an imperial piece made for one of the imperial palaces. I'm not sure if it would ever have been used to make a cup of tea but may have been used during the famous Chinese tea ceremonies. 'White jade is particularly rare and is very much sought-after by the Chinese because they regard it as pure." The teapot is nearly eight inches long and five inches high. It has a compressed circular body and a C-scroll handle with two grooves on the end." I bought this magazine in Hong Kong last December. Published by Wu-Shing Books, this "Tea Art" magazine, is entirely written in Chinese and this particular issue has the cover article on Haiwan tea. This 496 page magazine (read from left to right) that I had purchased deals mainly with Pu erh tea, tea news and a teapot review. It also has numerous advertisements from tea dealers and teashops from around the world. It was interesting to note that there were a good number of Malaysian tea shops that took out ads in this magazine. This information would be useful when I try to make a visit to Malaysia next year. Click on the pix for enlarged views. The main cover article on Haiwan was very interesting. You can see the passion of the company founder, Mr Zhou Pin Liang despite his old age. Mr Zhou was credited with the development of ripe pu erh tea. There was even an article written by Chan Kam Fong, aka cloud, who had contributed many tea articles on the internet. In addition, this magazine also covered the various tea expos and shows during the past few months. The pu erh tea reviews were also quite interesting as well. I had received a few raw pu erh tea samples recently and I had found them to be more floral-like unlike the raw pu in my stash. Interestingly enough there was a review on a couple of pu erh tea in the magazine and there was in English the following comments "The last two teas were strange. They tasted like oolong teas that had been compressed as puerh. They weren't particularly unpleasant, but we didn't know how to review them or even rank them. There are many strange things in the Puerh world these days." I will find out more on this and let my readers know. This "Tea Art" magazine is heavily illustrated with photos and pictures that will thrill any pu erh enthusiast who may not read a single word of chinese. This is a 2006 Menghai 0562 ripe cake. The number '0562' merely refers to a recipe number. So for example, if you like the tea of a particular recipe number you can go your tea shop or internet to look for that particular tea. There might be different production years for the recipe cake you are looking for and the older cakes usually costs more than the newer ones. I had bought this cake in early 2008 from a tea dealer operating from Yunnan. He also sells on ebay under 'Yun_cha' (formally known as awazon). This cake, to me, was considered an expensive new cake costing me about US$25 a cake (inclusive air freight). 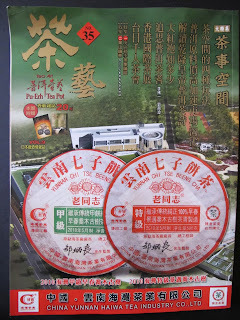 Well nowadays, I had noticed new 2011 pu erh cakes going for more than US$200 per piece (not counting the freight yet). Back to this cake. You will noticed that the wrapper of the pu erh states that this was an award winning cake, gaining gold in a tea expo in China. This tea cake is tightly compressed and you would require your tools to break up the cake. I actually did a second look when I brewed this tea for the first few times. I had opened a 05' Haiwan pink wrapper ripe cake a few weeks ago (see 1 April blog entry) and I thought I had brewed the Haiwan tea instead. The taste, aroma and aftertaste were similar among these 2 cakes. Not that I mind, but anyway the 0562 had an additional very subtle herbal taste to the tea. Both cakes possess a nice sweet finish in the aftertaste (Haiwan, to me, was slightly sweeter). I found brewing this tea makes a very enjoyable tea session. I would tend to buy a couple pieces of teaware everytime I am in China. I am fascinated by the porcelain teaware in the tea markets as the variety never fails to astound me. Yes, there are very high quality collectors' porcelain teaware. You can find very intricate artwork on the porcelain or the finishing artwork will make your jaw drop to the ground. I saw a set of tea cups, handpainted with Chinese landscapes complete with beautiful Chinese calligraphy, whose thinness of the porcelain was like egg shells and it has a bewitching translucent quality when you hold the cup against a light. I did not buy this set as I tend to be accident prone when it comes to delicate porcelain. There are collectors who are fans of certain porcelain artistes and would buy every new series when its available. These range of porcelain are usually quite expensive. The less expensive option for many tea drinkers would be to buy their teaware from the 'mass production range'. They are inexpensive and you can find a wide range of teaware that will appeal to you. The above pix are examples of teaware which are inexpensive and to me, very well made. I found the quality and finishing excellent and they make a tea drinking session more enjoyable (to me). I must emphasize that in the wholesale tea markets of China, you will get a good price if you buy in bulk. The tea shops may sell you individual pieces but you may be paying a much higher price. 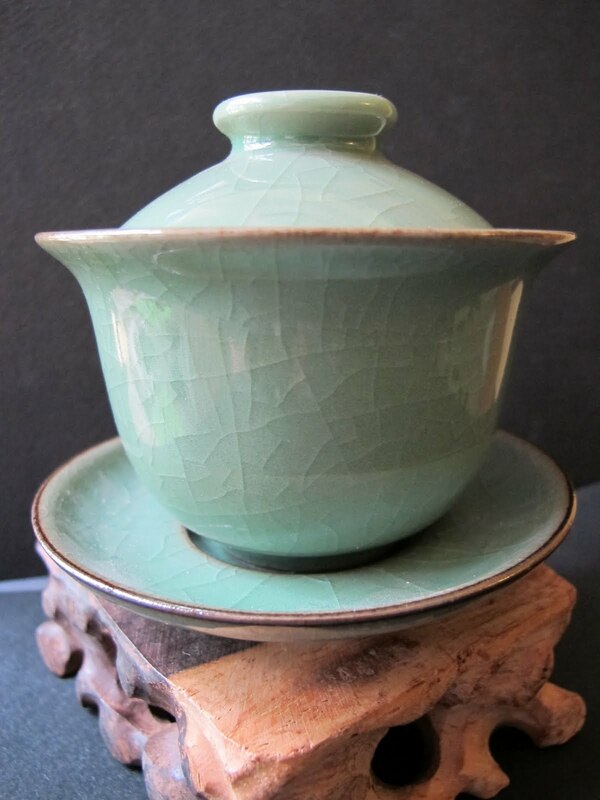 One more thing, I tend to hand-carry these porcelain (which can be a pain) as these pieces, if packed in check-in luggage, may end up in several more pieces when you have reached your destination. I was in Guangzhou and Hong Kong during the Easter week. The weather was nice and warm that I could go round the city in just jeans and a t-shirt. Getting really warm though. During this trip, I met up with my regular tea dealer friends and...... made a good friend with a French tea dealer and had the privilege of learning and gleaning more information about tea as well as about the tea business. I was also humbled to meet a few teamasters while in Guangzhou and Hong Kong and had the chance to experience their generosity in their sharing of tea knowledge, as well as they sharing some of their rare teas with me. More on this later. Most of the green teas from spring 2011 were already available in the tea markets. 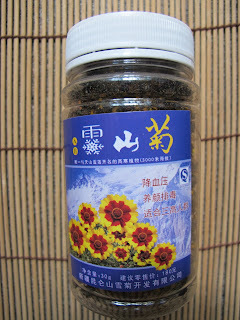 Some 2011 Pu erh from the established brands were also available in the tea markets. The 1st pix shows Long jing tea leaves otherwise known as dragon well tea. The 2nd pix shows Mao jian tea from Henan province. 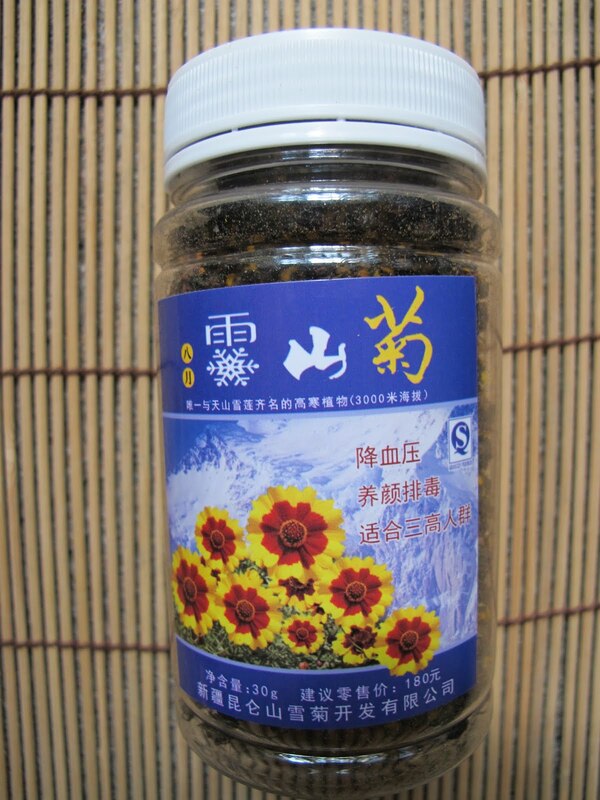 The 3rd and 4th pix are of a new product found in the tea markets. This is 'snow mountain chrysanthemum'. Yes, chrysanthemum is a common drink but these really tiny flowers from this area were impressive in that just 5 buds used in a 100ml gaiwan would yield about 6-8 infusions easily. Subtly sweet. Nice and refreshing. The last pix shows Da Hong Pao packed in small box (cigarette size), two 10g pack in a box and then 10 of these boxes in a carton. This tea, during my tea sampling session, was robust in taste, well roasted and produced a nice full flavor in the mouth that lasted a good few minutes after drinking down the tea.